STEC has released the MACH16, a slim form factor SATA SSD that offers enterprise grade technology for embedded applications. STEC's MACH16 is designed to be a drop-in replacement for 2.5" hard drives and even SSDs that offers 22-pin SATA support with high data integrity, endurance and reliability thanks to STEC's own enterprise SSD controller and firmware in a form factor that's just 54mm X 39mm X 4mm. The SATA 3Gb/s SSDs offer sustained read performance up to 245 MB/s for 128K operations and writes of up to 150 MB/s. STEC sees a wide array of use cases for the MACH16 slim SSD including embedded solutions like network and telecommunication systems, military vehicles, rugged PCs, gaming systems, digital signage, transportation systems, ATM machines, kiosks, point-of-sale machines, cash registers, printers, GPS systems, vehicle infotainment systems, data loggers and medical equipment and other systems that use small-format system boards like Mini-ITX, Pico-ITX and CompactPCI. All STEC enterprise SSDs include proprietary technologies like: CellCare flash management, Secure Array of Flash Elements (SAFE) Technology, which improves reliability, PowerSafe data protection in the event of an unplanned power failure, data-path protection and advanced error code correction, and advanced wear-leveling. 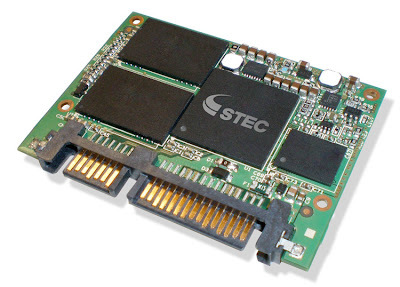 The STEC MACH16 Slim SATA embedded SSDs are available now, with capacities of 25 and 50GB.